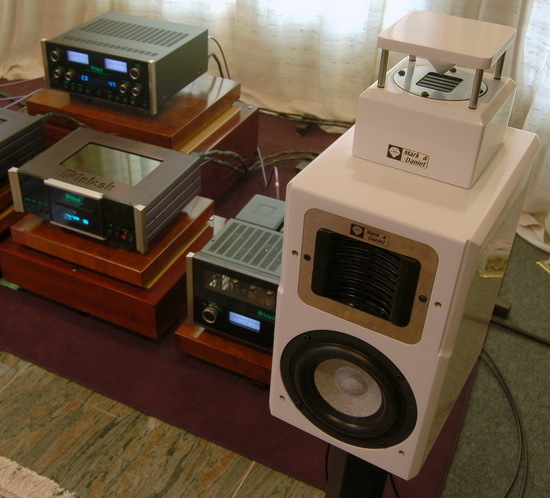 Q: I love vacuum tube amplifiers, would my 6CA7 (35W output) power amplifier enough to drive M&D® speakers? A: Of course, it is applicable for a beautiful reproduction under normal volume. You will, however, sacrifice one major advantage of Mark & Daniel® system; its outstanding dynamic output. If possible, take two identical vacuum tube amplifiers with bi-amp configuration to drive M&D bi-wire speakers; this pseudo electronic-crossover system may be helpful in providing the necessary power, can also improve for the best sonic performance! Anyhow, choosing good solid-state power amplifier is a more effective solution. Sufficient driving current provides the best working condition for transparent, excellent transit and bass control, high dynamics sound reproduction of M&D systems over conventional speakers! It is also helpful to consider a vacuum tube pre-amplifier or CD player in your reproduction system to get the sound you want.